Home» Posts tagged "Class B"
Last week, we shared the first quarter 2012 office segment breakdown for the Harrisburg East submarket. This week, we reveal the first quarter 2012 office segment breakdown for the Harrisburg West submarket. Overall rental rates ended the first quarter at $18.02, a decrease of 15 cents per square foot over the previous quarter. Meanwhile, the Harrisburg Area West office market ended the first quarter of 2012 with an overall vacancy rate of 10.1%, a decrease of 0.9% from the previous quarter. There were no new deliveries or new construction at the end of this quarter. The average quoted asking rental rate for available office space, all classes, was $18.02 per square foot at the end of the first quarter 2012 in the Harrisburg Area West office market area. This represented a .15 cent per square foot decrease in quoted rental rates from the end of the fourth quarter 2011, when rents were reported at $18.17 per square foot. The average quoted rate within the Class-A office market was $20.74 at the end of the first quarter 2012, while Class-B rates stood at $16.83, and Class-C rates at $17.52. At the end of the fourth quarter 2011, Class-A rates were $20.27 per square foot, Class-B rates were $17.12, and Class-C rates were $17.32. Class-A projects reported a vacancy rate of 10.7% at the end of the first quarter 2012 compared to 13.7% at the end of the fourth quarter 2011. Class-B projects reported a vacancy rate of 9.0% at the end of the first quarter 2012 compared to 9.3% at the end of the fourth quarter 2011. Class-C projects reported a vacancy rate of 12.1% at the end of the first quarter 2012 compared to 12.9% at the end of fourth quarter 2011. Net absorption for the overall Harrisburg Area West office market was positive 61,200 square feet in the first quarter 2012. That compares to positive 20,290 square feet in the fourth quarter 2011. 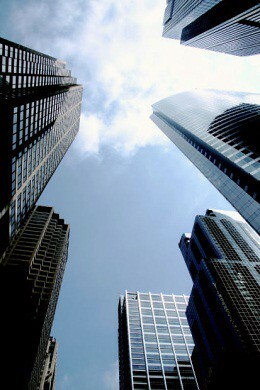 The Class-A office market recorded net absorption of positive 21,132 square feet in the first quarter 2012, compared to positive 19,754 square feet in the fourth quarter 2011. The Class-B office market recorded net absorption of positive 19,970 square feet in the first quarter 2012, compared to positive 92,214 square feet in the fourth quarter 2011. The Class-C office market recorded net absorption of positive 20,098 square feet in the first quarter 2012 compared to negative (91, 678) square feet in the fourth quarter 2011. The largest lease signing occurring in the first quarter 2012 in the Harrisburg Area West submarket was the Arbor Building, a 20,000-square-foot-property leased by the Holy Spirit Hospital Camp Hill from Kinsley Properties. Overall rental rates ended the first quarter at $16.86, a decrease of 16 cents per square foot over the previous quarter. 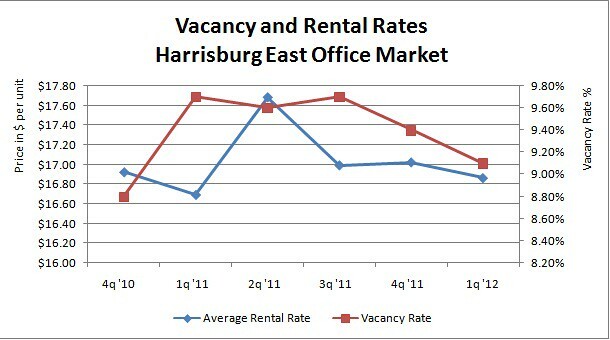 Meanwhile, the Harrisburg East office market ended the first quarter of 2012 with an overall vacancy rate of 9.1%, a decrease of 0.3% from the previous quarter. There were no new deliveries or new construction at the end of this quarter. The average quoted asking rental rate for available office space, all classes, was $16.86 per square foot at the end of the first quarter 2012 in the Harrisburg East office market area. This represented a .16 cent per square foot decrease in quoted rental rates from the end of the fourth quarter 2011, when rents were reported at $17.02 per square foot. The average quoted rate within the Class-A office market was $19.31 at the end of the first quarter 2012, while Class-B rates stood at $16.25, and Class-C rates at $15.42. At the end of the fourth quarter 2011, Class-A rates were $19.76 per square foot, Class-B rates were $16.68, and Class-C rates were $14.48. Class-A projects reported a vacancy rate of 7.5% at the end of the first quarter 2012 compared to 7.9% at the end of the fourth quarter 2011. Class-B projects reported a vacancy rate of 10.2% at the end of the first quarter 2012 compared to 10.8% at the end of the fourth quarter 2011. Class-C projects reported a vacancy rate of 8.0% at the end of the first quarter 2012 compared to 7.9% at the end of fourth quarter 2011. Net absorption for the overall Harrisburg East office market was positive 7,126 square feet in the first quarter 2012. That compares to negative (135,414) square feet in the fourth quarter 2011. The Class-A office market recorded net absorption of positive 15,831 square feet in the first quarter 2012, compared to positive 68 square feet in the fourth quarter 2011. The Class-B office market recorded net absorption of positive 1,419 square feet in the first quarter 2012, compared to negative (121,830) square feet in the fourth quarter 2011. The Class-C office market recorded net absorption of negative (10,124) square feet in the first quarter 2012 compared to negative (13,652) square feet in the fourth quarter 2011.. The largest lease signings occurring so far in 2012 include three properties represented by NAI/CIR: the 16,839-square-foot property at 30 North Third Street in Harrisburg as well as two properties at 8170 Adams Drive in Hummelstown – a 14,085-square-foot property and a 10,084-square-foot- property. 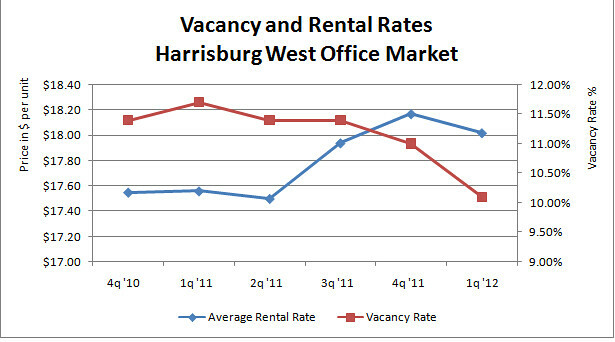 Stay tuned next week for the first quarter 2012 office market breakdown for the Harrisburg West submarket. In the world of commercial real estate, tenants will find that office buildings are generally classified as a Class A, Class B, or a Class C building. The difference between each of these classifications varies by market. Building classifications are used to differentiate buildings and help the reporting of market data in a manner that differentiates between building types. To help you better understand the office space you’re selling, leasing or buying, we’ve created a “cheat sheet” to give you the information you need to rapidly assess any building you’re considering. Location: Well-located with excellent access to amenities, restaurants, highways, etc. The above is just a general guideline of building classifications. No formal international standard exists for classifying a building, but one the most important things to consider about building classifications is that buildings should be viewed in context and relative to other buildings within the sub-market; a Class A building in one market may not be a Class A building in another. No matter what kind of commercial office space you’re interested in purchasing or leasing, contact us for the best representation. Want to know more about the Central Pennsylvania Commercial Real Estate Market? Omni Realty Group has the data! Over the coming months, we’ll be targeting different product types and market segments in an effort to help you better understand the intricacies of the Central Pennsylvania commercial real estate market.